Naval Air Facility Lossiemouth ? Re: Naval Air Facility Lossiemouth ? The issue with Leuchars as a relief ground is it doesn't have bulk fuel facilities any more, so you'd need to wait for them to truck in fuel if stuck there. The runway and flying control are still operational, and the EoS UAS still operates there. There is a Bowser of fuel there just in case of a divert, but not for visitors use unless by reluctant arrangement. Someone else also has a private bowser there, but only a few get a share of that. The UAS one is interesting as they come over to Dundee for fuel so how long that will last? Plenty other negative rumours spinning around, but time will tell on what will happen. Such a waste, after the runway work and other works done for Typhoon to keep Leuchars at the "forefront of Defence for the next 40 years". What a joke that turned out to be. does an independent Scotland need an airforce? The Aberdeen-based Press & Journal newspaper has a story today which says the RAF has confirmed that the first two RAF P-8s will be temporarily based at Kinloss from February 2020 due to the runway upgrades at Lossie. What was that earlier about Kinloss's runways being too short for P-8 operations? And could this also mean that the upgrade work at Lossie is perhaps falling behind schedule? 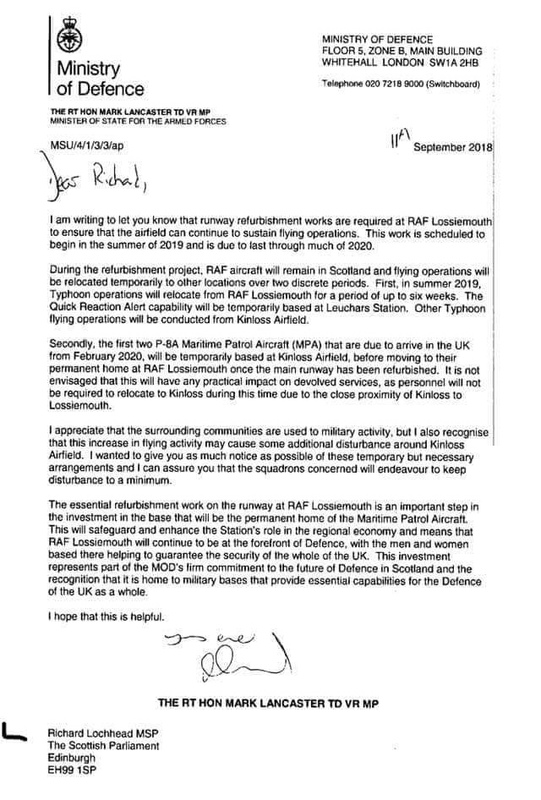 The story also says Lossie's Typhoons will use Kinloss for six weeks next summer, with QRA temporarily moving to Leuchars. The temporary use of Kinloss for the new P8's has been known for a while.Runway alterations at Lossiemouth are believed to be on course..QRA operating from Leuchars confirms again what has been thought for a while.The temporary use here will please quiet a few folk down there. I wonder if this will plant a seed in the corridors of Whitehall, and hopefully they'll realise that reopening Kinloss as a fully functional air station would be a wise move. I assume that the P-8's will initially be unable to operate at MTOW from Kinloss given the previous statements that the runway was too short. If this is so we're going to need USAF/KLu tanker support since Airtanker and the MOD didn't supply/specify Voyagers with boom refuelling capability. I want 2% of GDP and I want it NOW! I wonder if Airwakner are scrutinising the contract, looking for penalty clauses, for RAF aircraft being refuelled by non Airwakner assets. booking a trip up north for those dates! Yes Chris but the cleaver/tricky bit is working out which one or two days! And yes I do speak from experience. So from reading the above, it sounds like Typhoons will be based elsewhere for 6 weeks whilst work on the intersection can take place, before moving back and being able to use the cross runway. Kinloss will operate the RAF P-8s from Feb 2020 until such point in 2020 the main runway works are finished. You would imagine that Kinloss would also host other nation's MPA aircraft, much like Lossie does now. Glad to see Kinloss being utilised for flying again, and Leuchars. Lossiemouth Typhoons will relocate to Kinloss for the six week period.The cross runway 10/28 is only used occasionally when wind dictates.QRA launches though virtually always use the cross as it is nearest to the HAS site.